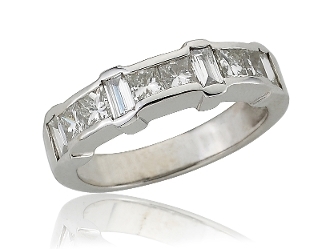 This stunning Diamond wedding band for her features a line of impressive alternating channel set princess & baguette Diamonds showcased in 14 Karat white gold. The ring has a 0.80 Carat t.w. Diamond. Perfect to say "I do", "Happy Anniversary", or "We can be together for Eternity". For added appeal personalize your item, select our Engrave option and indicate size needed when adding to Cart.